Hanging out, relaxing and cooking for yourself or loved ones is something that people of all ages like to do, especially older adults who have a background or passion for cooking. However, as we get older, a kitchen that used to meet our needs may need some adjustments to ensure we can safely continue cooking and enjoying meals. • Rearrange: Make sure the ingredients, equipment and dishes that you use most often are in easily accessible locations. Store frequently used items at waist level to minimize bending and reaching. • Make it easy: Make sure all cabinets and drawers are easy to open and close. • Step up safely: Invest in a sturdy step stool with a hand rail to access out-of-reach items. Never climb on a chair, table or stool not designed for climbing. • Take a seat: Have a stool or chair in the kitchen for resting while you cook to prevent fatigue or loss of balance. • Add a mat: Add non-slip mats with beveled edges to areas that might become wet, such as in front of the sink and the dishwasher. • Use smaller containers: Divide products from large containers into smaller and lighter containers that are easier to handle than heavy bags, boxes or jars. • Keep it tidy: Wipe up spills immediately. A wet floor is a slippery floor, and dry goods like sugar and flour can be a slippery as ice. For more tips and resources, visit www.steadyu.ohio.gov. 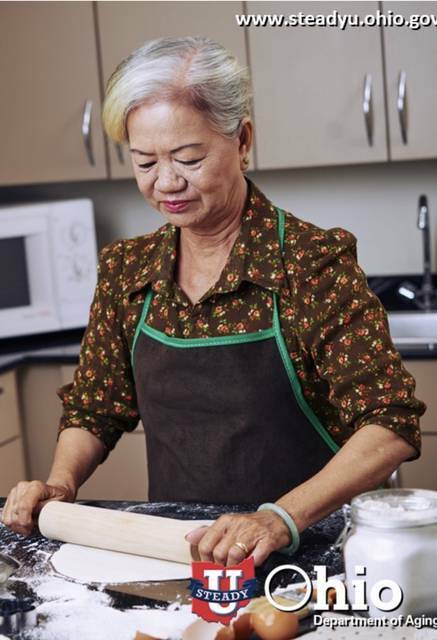 https://www.registerherald.com/wp-content/uploads/sites/41/2019/03/web1_kitchenhealthyu-1-.jpgHanging out, relaxing and cooking for yourself or loved ones is something that people of all ages like to do, especially older adults who have a background or passion for cooking. However, as we get older, a kitchen that used to meet our needs may need some adjustments to ensure we can safely continue cooking and enjoying meals.